1. Cut the butter to 1cm cubes and place it into a large mixing bowl. Add the flour, salt and sugar, then place in the freezer for 20 minutes. Using a stand mixer fitted with a paddle attachment, on a medium speed, combine the butter, flour, salt and sugar mixture until it looks sandy. 2. Switch to a dough hook and, on low speed, slowly add the ice-cold water. Once a soft pliable dough is formed remove from the bowl onto a floured work surface. Gently knead into a ball, cover with clingfilm and rest for 1 hour. 3. Roll out the dough to a thickness of 3mm and allow to rest for a further 20-30 minutes. Grease a 2.5cm x 20cm pie tin and lay in the pastry. Leave roughly 1-2cm of overhang around the edges. With the remaining pastry, cut a circle slightly bigger than the pie case and in the centre of the lid cut a 1.5cm diameter hole. 4. To make the filling, grate the Cheddar cheese over the apples, and mix with the sugar, flour and spices to coat. Set aside. 5. Preheat the oven to 180°C, gas mark 4. 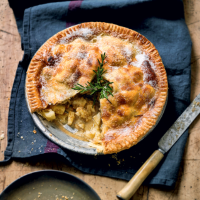 Fill the pie case with the apple and Cheddar mixture. Put the pastry lid on top and crimp the edges. Place half of the rosemary sprigs in the central hole. Brush the top liberally with egg wash, then bake for 20 minutes. Remove from the oven, add another layer of egg wash, lightly dust with granulated sugar, and bake for a further 15-20 minutes until golden. 6. Remove the roasted rosemary from the pie and decorate with the remaining fresh rosemary. Serve warm in slices with Heston from Waitrose Caramel Popcorn Ice Cream.